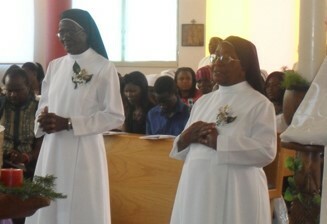 On December 6, 2013, all the Sisters and Formandees gathered together with great joy and thanksgiving for a vigil meditation for our Golden Jubilarians: Sr. Agatha Leonhard and Sr. Elisa Akapeke. As morning broke the next day, the Feast of St. Ambrose, a group of Sisters awakened the Jubilarians with a song. The main celebrant, Most Reverend Archbishop Liborius Ndumbukuti Nashenda, concelebrating priests and our Sisters accompanied the Jubilarians in their entrance procession of the Eucharistic Celebration with a song and dance by the Formandees. In his homily, the Archbishop said that children learn from the wisdom of old age according to the African culture. He addressed the Jubilarians that they have proved to be redeemed and have received God’s grace of endurance. He affirmed them as an example of what it means to endure. He also admonished them to embrace God and prefer nothing to Christ as St. Benedict wrote in RB 72. In their thanksgiving speech, the Jubilarians thanked all who touched their lives and humbly invited everyone for a “cup of cold water” in St. Mary’s Hall which meant to be a meal. With songs and dance, everyone moved to the hall for a delicious lunch prepared by our Sr. Cecilia Asser and the kitchen staff. While everyone was enjoying the “cup of cold water”, our Sisters, Formandees and the Jubilarians’ family and guests shared their talents in the program for the Jubilarians. Finally the family members and friends of the Jubilarians gave their gifts to the Jubilarians who happily received them with both hands.